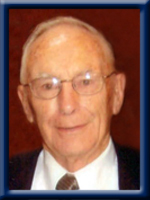 Cody; John Medley “Jack” Jr.
CODY – John Medley “Jack” Jr., 87, of Beach Meadows, Queens County, passed away peacefully in the Veteran’s Unit of Fisherman’s Memorial Hospital, Lunenburg on Monday, July 1st, 2013. Born in Worcester, MA, he was a son of the late John and Mary (Roberts) Cody. John was a veteran of World War II serving with the Royal Canadian Air Force in England. Following the war, he returned to school in Boston and became an aircraft Maintenance Engineer. He returned to Canada and worked in aircraft maintenance before becoming an Air Worthiness Inspector for the Department of Transportation retiring as the Director of the Atlantic Region. After his retirement, he acted as a consultant for a few years. He was an active member of St. Andrew’s Anglican Church, Brooklyn and served as a lay minister. John enjoyed the outdoors, spending time working on his property and gardening. His greatest joy was spending time with his family, especially his five grandsons. John is survived by his daughter Suzan (Dr. Garry) Morash of Beach Meadows; his grandsons Josh (Tiffiney), Joel, Jake (Emily), Jeffrey (Lauren) and Jordan, his great-grandson Nolan as well as a number of nieces and nephews. He was predeceased by his wife Doris (Harding) and his sister Jean Fullerton. Cremation has taken place under the direction of Chandlers’ Funeral Home, Liverpool. Funeral service will be Thursday, July 25th, 2013 at 2:00 p.m. in St. Andrew’s Anglican Church, Brooklyn. Reverend Judy Cross officiating. Burial will be in Seaside Cemetery, Brooklyn. Family flowers only, donations may be made to any charity. Online condolences may be made to www.chandlersfuneral.com. Offer Condolence for the family of Cody; John Medley “Jack” Jr.
Suzan and family, So sorry to hear of John’s passing, he will be missed by all. You are all in our thoughts and prayers. Suzan & Family.My deepest deepest sympathies.I feel very fortunate to have spent time with John & share his truely interesting stories.Ones I will remember for a lifetime. The finest Gentleman I’ve ever met. Suzan and family. Please accept my sincere sympathy on the passing of your father. My prayers are with you. Dear Suzan, Garry and family, Our thoughts and prayers are with you during this difficult time. However, you could always feel the love and pride he felt for his family. We are very sorry to hear of John’s passing. We remember him as a supportive and classy sports fan supporting all of the boys at the soccer field and hockey rinks. We hope that the many great memories that you have of John will comfort you during this sad time. Suzan, Garry and family, you are all sent our deepest sympathy on your loss. Our thoughts and prayers are with you all. God bless. ON BEHALF OF THE ROYAL CANADIAN LEGION, BRANCH #69 OF SAINT JOHN WEST, I WOULD LIKE TO SEND OUR LOVE, PRAYERS, AND HEART-FELT SYMPATHIES TO THE “CODY” FAMILY, AT THIS SAD TIME OF LOSS. JACK WILL BE GREATLY MISSED BY HIS COMRADES LEFT BEHIND, AS WELL AS HIS FAMILY AND FRIENDS, BUT WE UNDERSTAND THAT GOD KNOWS WHAT’S BEST FOR EACH OF US. MAY GOD GRANT YOU PEACE, CONTENTMENT, AND AS TIME GOES ON, MANY SMILES, AS YOU REMEMBER JACK’S GOOD TIMES AND FOND MEMORIES OF THE PAST! GOD BLESS YOU ALL WITH HIS LOVE AND WARMTH! Suzan, Garry and family – Please accept our sincere condolences on the loss of your Dad. We know what a difficult time you are going through but we have found that as time goes by, the memories you share with family, will bring you peace. Sorry to hear about your father. He was a very nice man and very proud of his grandsons! Take care! Sue, Gary and Family, We are so sorry to hear of your loss. We send our deepest sympathy. Sue,Gary,and the boys so sorry to hear of the loss of your father. still remember him coming to all the hockey,soccer games to watch.You are in our prayers. Sorry to hear about Uncle Jack, Thinking of you at this time. Susan and family, so very sorry to hear of Uncle Jack’s passing, our thoughts are with you. I just recently learned news about Jack’s passing. In 1970, I met Jack. I guess you could say he saved my life; he hired me. I’ll never forget him. I believe Jack was 46 when I met him. I thought that was old. Today, I’m 72; 46 wasn’t that old. One thing I know for sure, Jack loved his grandsons; I know he knew they were a blessing; his eyes lit-up when he mentioned them. Looking back over the years, I have to say Jack taught me a lot about writing and a bunch of other things too. Jack was the best boss I ever had. Jack was a kind man; he respected others; humble people do that.